Seven Dials, what happened to the Monmouth Street contraflow? 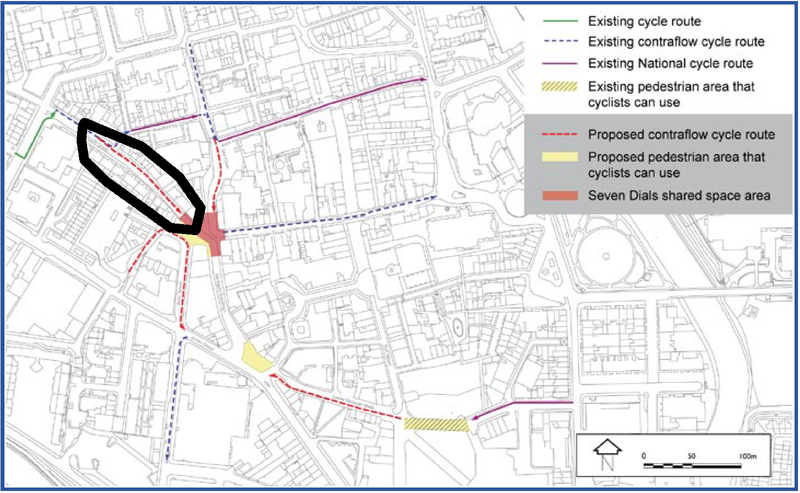 So in theory as part of the delivery of this scheme, this TRO SHOULD have been applied for at the same time as the Avon Street TRO, sometime around the middle of January. So what happened? Why did council officers not apply for this TRO? When asked, the reason given that this TRO has not been implemented is that it impacts parking on Monmouth Street and it would be considered after the parking review announced by the Conservative led council on the 4th of June 2015. So a pro-cycling TRO that was supposed to be initiated in JANUARY 2015 under a Lib Dem led council will not be implemented because of a Conservative council led parking review announced in JUNE 2015! This really does raise some extremely serious questions that must be answered by council officers and the relationships they have with councillors. Is this professional misconduct? I also feel this demonstrates that senior council officers consider cycling in the city a joke, when a few parking spaces can trump the ability for people to cycle safely into the heart of a city. I strongly suggest people write to their local councillors and ask them to investigate this. We need answers. Cambridge: Britain’s Cycling Capital from STREETFILMS on Vimeo. The question is how do you get a council like the one in Cambridge? Cambridge has always been a cycling city – I was born there in the sixties and cycling was the norm growing up. Helped by a large number of students in the city (not up a hill) and by being flat. Politics I think often follows rather than initiates. Cycling is growing in Bath and provision is better than when I first came here in the eighties. So how do we more quickly make Bath a place where cycling is more the norm and therefore has to be supported politically? We need prioritisation of cycling using segregated space. The problem is very much inside the council officers. When you can have a blank canvas like Radstock and still deliver a space where cyclists are advised to dismount rather than provided with their own segregated routes through the scheme, you really do have a council that does not “get it”.BaNES thinks shared space is “good enough”. We need on-road segregated cycle tracks on major routes at the expense of parking. These are politically hard to deliver. REALLY hard. Agreed. So how do we change the politics? It needs people to write to their councillors and express that good cycle infrastructure is key. Whenever people complain about pavement cycling, they blame the cyclist, not the fact the council officers in Highways have delivered a public ream space where people feel it is unsafe to ride on the road, where a cyclist shares the pavement with people walking. Cycling needs to be a core transport priority on everything the council does and not a tick box “shared space will do” exercise. The council needs to take cycling seriously. Sounds a bit like hand-to-hand combat. Are there other additional approaches that will get cycling up the agenda and done better? Should we be supporting the campaign for a B&NES mayor (http://mayorforbanes.org/) – seems to have been a positive thing for Bristol? Is there an big issue we could focus on with other campaign groups e.g. is air quality affecting children’s health? Perhaps we could congratulate the council on what is working e.g. increased parking restrictions, car-parking costs, Batheaston bridge…? Well seeing as the UK has 16% of boys classified as obese and the Netherlands has only 1.6%, council transport policies absolutely define the health of your residents. This does not seem to be recognised. It’s pretty crazy if you ask me. The only thing you can do is to keep hammering this home to your local councillors.